In the pre-World War II era, those opposed to war in Europe dubbed themselves “America Firsters.” They argued that “foreign entanglements” overseas would divert the loyalty of Americans from their own land and their own Constitution. Their opponents, of course, argued (I think rightly) that “America First” merged instead into an “America Only” attitude that endangered the world and, ultimately, America itself. We hear an awful lot these days about the Kingdom of God, and rightly so. Jesus himself calls us to seek first the Kingdom and God’s righteousness, even before such primal necessities as food and clothing (Matt 6:25-34). Often, though, the Kingdom is defined in decidedly boring terms… another denominational program, another political slogan, another campaign for more private devotional times or community improvement projects. The Kingdom of God, though, is an explosively veiled inbreaking into the present world order of the reign of Jesus himself as emperor of the cosmos. It ought then to change the way we see ourselves, and our place in this age and in the one to come. A Kingdom apathy leads to carnality, the very kind of carnality we see in so many of our listless, unevangelistic, divided churches. At the same time, a “Kingdom only” mentality can seek to transform the present order into the Kingdom of God through means other than the power of Christ. That leads, as it turns out, to carnality too. Ultimately, the Kingdom comes not by messianic zeal but by the zeal of the Messiah. Earlier this month, I started a book project with Crossway publishers called Kingdom First: How the Reign of Christ Transforms Our Lives, Our Churches, and Our World. The book will look at how our vision of the Kingdom can upend our vision of the here and now, from the way we see environmental protection to the way we structure wedding ceremonies to the way we break the bread at the Lord’s Table. I’ll be posting here from time to time about these things, hoping you’ll help me think through them as I write. 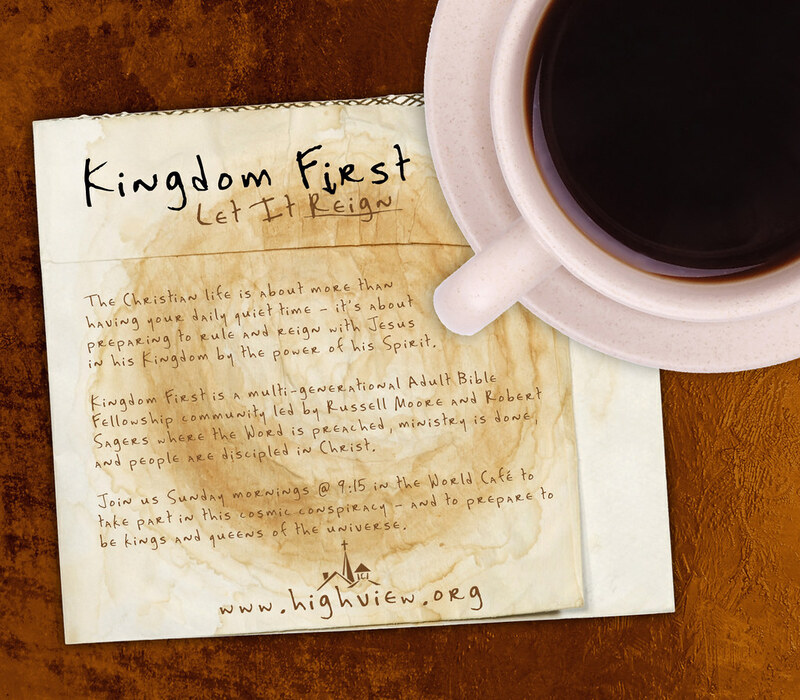 At the same time, this past Sunday, a group of us lanched a new adult Bible fellowship called “Kingdom First” here at Highview Baptist Church where I serve as a preaching pastor. We’re going to be looking at the present reality of the Kingdom as we study the Word of God together. If you find yourself coming through Louisville, we’d love to have you stop in and talk about the Kingdom with us. In the meantime, watch this space for some Kingdom conversation, and let me know how the reign of Christ is transforming the way you follow our Galilean king. Should a Minister Officiate at the Weddings of Unbelievers?